British heavyweight star Dereck Chisora has slammed rival heavyweights Tomasz Adamek and Deontay Wilder and told them he’s coming for them next. Chisora takes on German Edmund Gerber for the Vacant European Heavyweight title on Saturday 21st September at the Copper Box Arena with top contenders Adamek and Wilder also on his hit list as he marches towards a second world title shot. Talks with Adamek’s promoter had been ongoing for Chisora to face the Polish hero, a former world champion at light-heavyweight and cruiserweight, later this year in London, but terms could not be agreed. Instead, Adamek has taken a fight with Vyacheslav Glazkov on November 16. Glazkov drew with Malik Scott in February this year in fight that many felt the American had won. 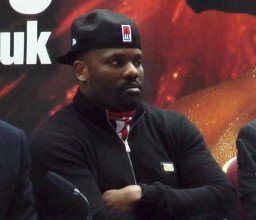 Chisora would then inflict the first loss to Scott’s record in July this year when he stopped him in six rounds at Wembley Arena. Finchley puncher Del Boy is more enraged that unbeaten Deontay Wilder recently slipped into Great Britain on the quiet to spar with David Haye, when he claimed earlier this year that he couldn’t leave the US to fight Chisora at Wembley Arena on June 15 because of his arrest for battery. Dynamite-punching Wilder, who has knocked out all 29 of his opponents, recently stopped former WBO World Heavyweight Champion Siarhei Liakovich in the first round, bringing his record of first round knockouts to 17, but Chisora is desperate to fight the unbeaten American and inflict the first loss on his record like he did to Scott. Next boxing news: Will Tom Zbikowski return to boxing?